Do you hate the new Minecraft combat system? Remember when you could actually win a fight against more than one zombie? ME TOO! SO DOWNLOAD CLASSIC COMBAT AND BRING IT BACK! It's 100% server-compatible, mod compatible, and efficient. It won't affect your game/server's performance in any way. Want to bring the new combat system back? Easy, just remove Classic Combat and continue using your same world without any issues. No more attack cooldowns. You will always hit for the attack value of the weapon you're using, no matter how long ago you used it. The "swing" graphic is still shown when attacking something. Damaged "hearts" are still dropped when something is attacked. You can still dual wield. You can still use shields. Your cooldown indicator will still show and function, however it no longer has effect. 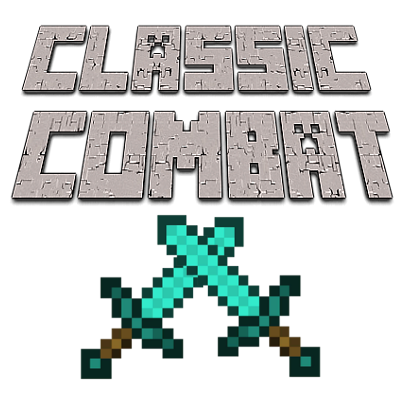 Feel free to use Classic Combat in your modpack, just provide credit and preferably link back to the download page. PMs asking for permission to use in a modpack will not be answered. is this 1 to 1? like, if i use it on hypixel (don't message me about use at own risk) will i get banned for clicking too fast or something? i wanna use 1.8 combat but 1.8 is a HORRIBLY unoptimized version. Recently I've been having troubles with this mod, and through those troubles I have found a solution. For some reason a patch in forge makes it not possible for this mod to work, I don't know why but it just doesn't. I've been trying to make an adventure modpack and found the timer unbearable as I cannot battle anything without super op late game gear. Any way, to be able to play this mod the latest version you will be able to use is forge-1.12.2-14.23.3.2699 that is the latest version I could find that works. Yes, this means that you will have to re download later versions of some mods because they will not be compatible, but I find it necessary to even play 1.12.2. Yeah, this isn't working for me either. Damage is a fraction based on what the cooldown is. It's crazy how there aren't any 1.8 pvp for 1.9+ it's something so many people want... Do you have any idea on when you will be able to release this plugin, I've been looking for days for a mod that brings back 1.8 pvp. I don't know if I'm missing something here. I downloaded the mod for 1.12.2, and moved it to the "mods" folder in my .minecraft folder. I'm using Forge 14.23.5.2779 and LiteLoader 1.12.2. When I click on the "Mods" button on the main menu, the Classic Combat mod is in the list. When I load a world and pause the game to look at the mods, the Classic Combat mod is in the list. However, the attack cooldowns are still there. Let me know if I can provide an error log or something else to help, as I know this probably isn't enough information to diagnose this problem. It states under the 'what's not changed' section of this mod page that the cooldown 'icons' and 'animation' are there are not removed but they basically do nothing, so they will be displayed but not function alongside their intended older combat purpose. So the mod works it's just the display icon isn't removed/invisible is all. If the 'function' legitimately is still there besides the not removed which is more what your saying I assume then well. I'm not sure. Maybe it's conflicting with something or you need to apply it serverside, if your running it in singleplayer it should work fine but multiplayer it won't work clientside/on with the 1 player and needs to be applied to the server so it works for multiple players to be able to use it. it already has a 1.12.2 version. you checked the files section, right? well, what's exactly the error? the game crashes? does it just open without any mods? I would really like to update this mod if you allow it. Is this needed only serverside or both serverside and clientside?